LIFE Leadership’s award-winning book ‘Financial Fitness’ details how anyone can achieve good financial “health” by following simple principles. We call it ‘The Money Thing’: that elusive, often difficult mystery of acquiring, keeping, and continuing to produce enough money to be able to live the life of our choosing. LIFE Leadership’s ‘Financial Fitness’ offers valuable advice for anyone who wants to tighten up his or her budget and live a financially “fit” life. In fact, the advice is so practical and helpful that the book has been recognized by several groups as a valuable contribution to the knowledge base of personal finance. In March, ‘Financial Fitness’ was awarded the Personal Finance Silver Medal in the 2014 Axiom Business Book Awards. And just recently, in another confirmation of the soundness of its financial principles and its effectiveness at teaching them, the book received the Bronze Medal in the Finance / Budgeting / Business category of the 2014 Living Now Book Awards. Developed by the founders of LIFE Leadership, including ‘New York Times’ bestselling authors Orrin Woodward and Chris Brady, ‘Financial Fitness’ is a candid look at personal finance and how the decisions individuals make affect their overall financial health. The authors explain that just as with becoming physically fit, becoming financially fit is a matter of having the right information and taking action on that knowledge. Therefore, the book provides forty-seven principles covering all of the important aspects of personal finance (the offense, or making money; the defense, or budgeting and discipline; and the playing field, or rules and philosophy of money). By doing this, the authors hope to show readers that, regardless of their current financial situation or the present economic climate, they can learn to prosper and conserve the fruits of their labor and master their money simply by understanding these basic principles of financial success and applying them to their lives. In addition, they have created a twelve-month subscription package expounding on the time-tested principles and outlining what they have learned firsthand about financial fitness. Subscribers receive one audio recording per month, for a full year of reinforcement and encouragement to continue working toward financial goals. 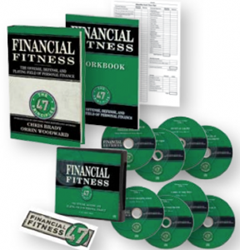 For more information on the ‘Financial Fitness’ book, the ‘Financial Fitness Pack,’ or the Financial Fitness Subscription, visit http://bit.ly/1u9DiCL. LIFE Leadership is based on the collective experience and wisdom of today’s best financial minds. The founders are internationally recognized business and leadership experts and bestselling authors, including ‘New York Times’ bestselling authors Orrin Woodward and Chris Brady. They teach time-tested principles and strategies for growing and maintaining wealth in any business and any economic situation through their books, audios, live events, online Rascal Radio station, podcast recordings, and more.